AirPix FPV is another great company in the RC industry that you should look out for. They have been around for a number of years now, and they recently started focusing on FPV racing, designing and producing good quality mini quad frames and parts. We just only reviewed another awesome mini quad frame from them, the AP180 so check it out. The mini quad frame comes in a nice package, thumbs up for the presentation. Apart from the frame, a Demon Core PDB is also selectable, which has 5V/12V output and built-in LC filter. The arms are 4mm thick, and the body plates are 1.5mm. Motor holes on Arms support M3 bolts, and they are wide enough for 22XX size motors. Note that the frame pillars (standoffs) are made of light weight aluminium. They are extremely strong, but they are also heavier than the Nylon ones. The Airhog 180 can be turned into a 210 frame by replacing the arms, making it a very versatile and unique design. 180 frame can support up to 4″ propellers, and the 210 can support 5″. 180 mini quad running 4″ props has the advantage of being smaller and can go through tiny gaps, and has excellent agility. 5″ mini quad can handle larger props therefore produces more thrust and flies faster in general. If you can’t decide between 180 and 210, then why not get them both? The arms can be purchased separately, so you can get arms for both configurations. With my Cobra 2204 2300KV motors setup, I could just replace the arms and turn my 210 into a 180 without replacing any components. When assembling the arms, I prefer to put the bolts facing up (2nd picture below), rather than facing down (3rd picture) as suggested by the official site. You can save a bit more space inside the frame for your components (a few mm), I personally don’t think it’s a big deal. In fact with the bolt facing down, you cannot un-tighten them once you put the top plate on. While having them facing up, you can. Either you need to fasten the bolts a bit more, or need to swap out arms, you can now remove the bolts without taking the top plate off. However that’s entirely up to you. I really like this frame, carbon fibre is excellent quality as you have already seen in the AP180. However I need to point out the camera mount design still has room for improvement. Because the mount is supposed to have a 20 degree angle, that really puts stress on the nylon standoff and aluminium bolts as you can see from in the 3rd picture below. I messaged the frame designer about this issue, and they have decided to replace the nylon standoff with rubber mounting pillars (aka shock absorber) in any future orders. They allow bending and will put much less stress on the frame. Also it might help camera image quality too hopefully. The frame feels very strong and sturdy. I reckon this frame could take some serious bashing. I need some more stress testing in the coming weeks to confirm that. Here are some more build pictures of this frame. 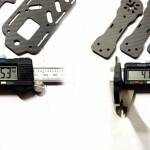 5″ arms weight 14g each, and the 4″ arms weight 11 grams. The total weight of the 210 frame is 135g, while the 180 config weights 123g. It could be a bit on the heavy side for the mini quad frame we have reviewed so far. But bear in mind these are 4mm arms! Strength comes with a price, and that is weight. As for motor to motor distance, I haven’t measured the 180 config, but the 210 config is slightly larger, at 215mm. Replaceable arms, instead of unibody for 180/210 design. I am sure I will discover more as I start building this mini quad. I will come back and update soon! Hi oscar…Gud day…sir, i would like to ask why is it everytime that may racequad would crash, both front arms moved backwards? That id still have to pull it back so that it will go ba k to its pla e? Though iv tighten it up that much?